Today is one of those strange days with a notable date: 11.11.11, ignoring the 20 of course. (I wonder if anyone back in the 12th Century noted the date when it was 11.11.1111?!) A few days ago Photo111111 asked people to take a photograph at 11 seconds and 11 minutes past 11am on 11.11.11. and then submit it to their site. There is a plan that the collected photos might form part of our local E17 Art Trail in 2012 – great idea which I hope works out! So here is my picture … not as exciting as I had hoped but taken as accurately as I could. 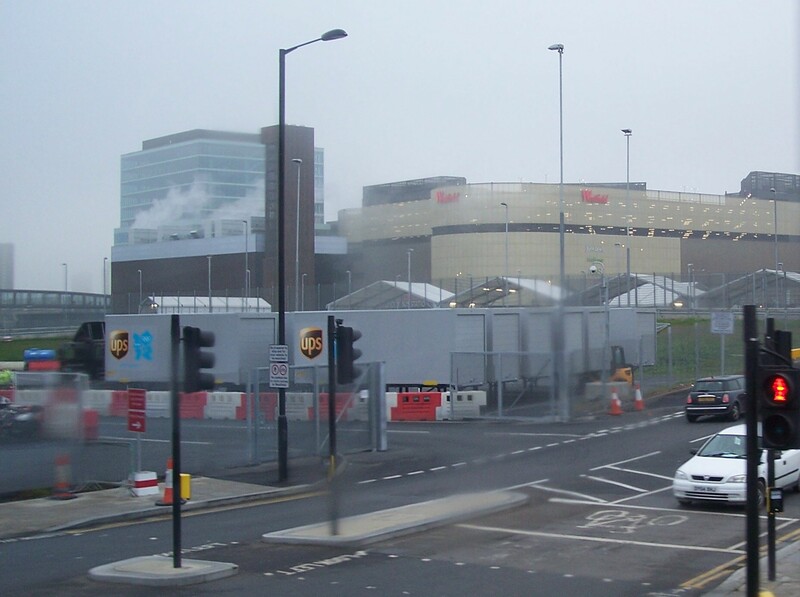 As you can see from the caption this is the (rather uninspiring) approach to the recently opened Westfield Stratford City Shopping Centre in East London, especially unexciting on such a grey day. It was taken from the front upstairs seat of a Transport for London No 97 bus. The bus stopped for to observe the 2minutes silence otherwise we would have been nearer or even there. The zig-zag roofs are the tops of the security centre through which all incoming traffic, including buses, has to pass before entering the centre. It feels a little like the going through security at the Channel Tunnel. Westfield Stratford City is situated next to the rapidly growing site for the 2012 Olympic Games (more of that to follow). It is a short ride from home, a rather stop-start journey taking around 30 minutes even though the distance is only 3 miles. I was hoping to have been a bit closer – or even at the centre – but such is life (and London traffic). Vicars have one day off each week. My husband usually takes Friday and today we decided to pay a proper visit to Stratford Westfield for a ‘nose round’ and some Christmas shopping. Stratford Westfield is massive and is currently the biggest shopping centre in Europe. This was my first real visit to the centre. 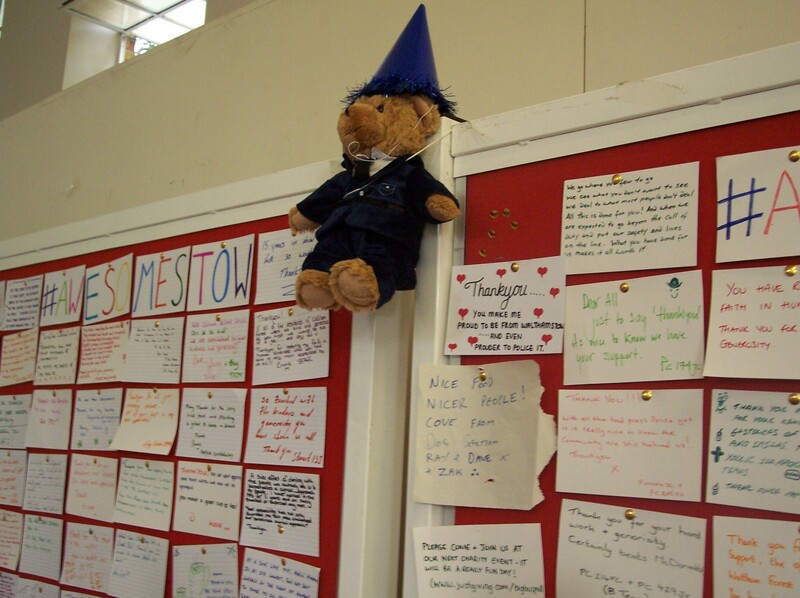 We made a brief visit a week or so ago, not to shop but to pray with other local Christians for the area and the coming Olympics and to be shown around ‘InSpiration’, the rest and faith space situated in the Café Court area and signposted ‘Calmness’. (It is open to anyone, of any faith or none and is a great place to pop in for a rest.) 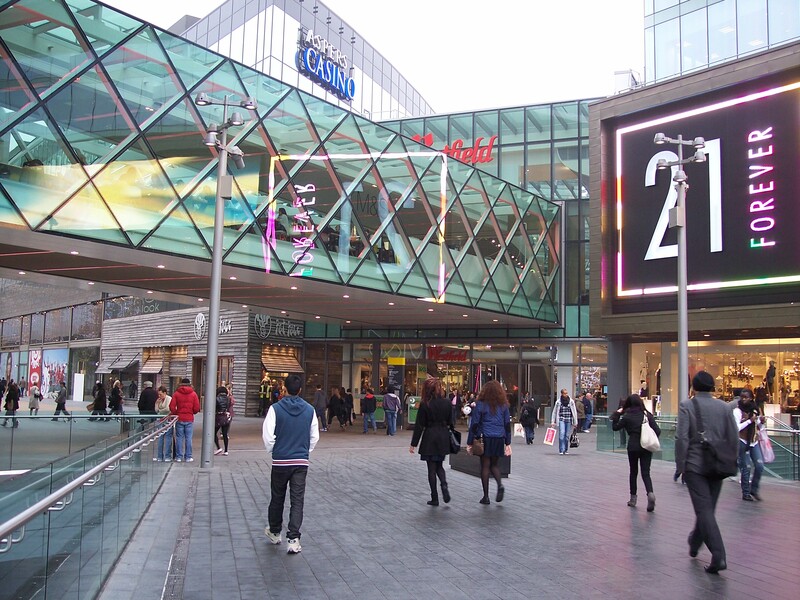 Westfield has many many shops of all types, small businesses and large chains, on four levels inside the centre with even more outside. It is linked to the original Stratford shopping centre with its indoor market by a bridge which passes both Stratford Underground and the old bus station, currently being spruced up ready for reopening. We saw just a small part, leaving me feeling rather confused and overwhelmed: definitely need another visit to feel more orientated … and to do more shopping! I normally write about food and make no exception with this post. On our brief visit we saw just a few of the many eating places in the Café Court we had heard about from friends. There is a vast choice of cafés and restaurants mostly collected together in one area of the shopping centre but covering four floors vertically. The choice of food is vast, ranging from rolls, wraps and sandwiches to Sushi and Fish & Chips to … well, pick any type of foreign food you like! …and there are more restaurants outside the main indoor centre. 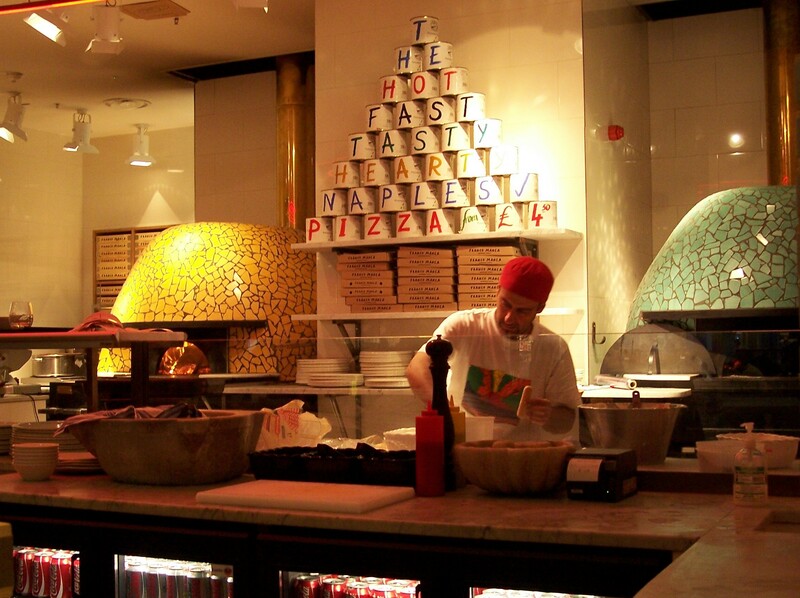 One advantage of open plan eating food courts is that you can see what other people are eating and as a consequence we decided to share a pizza at Franco Manca’s. 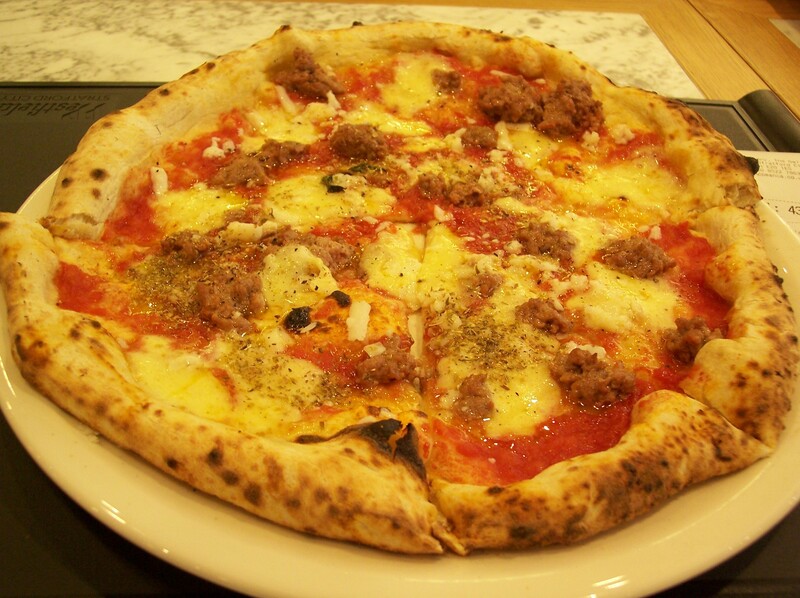 We made a good choice and I would recommend our Spicy Lamb, Mozzarella & Tomato Sourdough Pizza. It was fascinating to watch as our pizza was produced in super quick time using their 500oC/930oF traditional Neopolitan style wood burning oven. We shopped and we ate, but we also made a visit to the top floor of John Lewis department store where there is a viewing gallery overlooking the 2012 Olympic site. 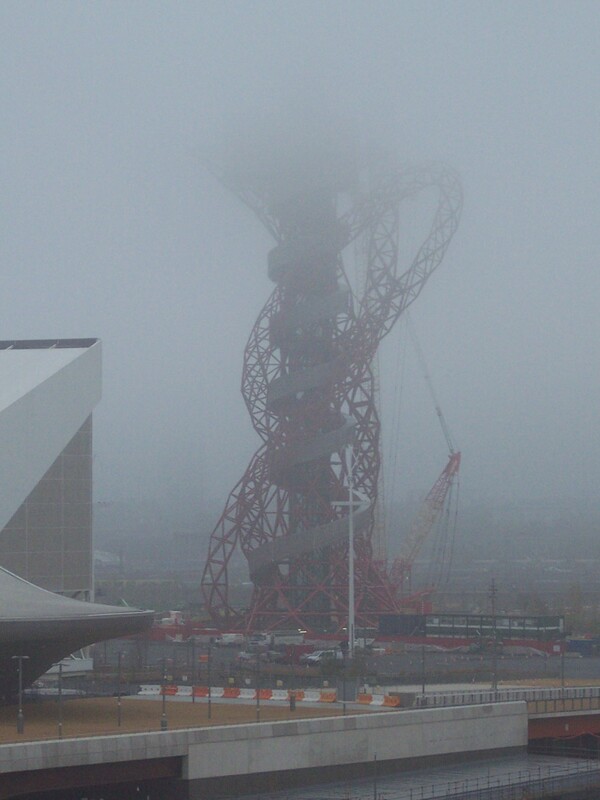 The Orbit Tower, a red latticework sculpture by Turner Prize winning artist Anish Kapoor at the centre of the site, is gradually rising towards its planned height of 115m (377ft). Sadly today its top was shrouded in mist. It was such a pity it was so very grey today, but the view was slightly brightened with the busy yellow diggers and fluorescent jacketed workmen. Although we recognised some of the buildings we were not sure about them all but we could see the Aquatics Centre on the left hand side and the central Stadium. Had it been clearer more buildings may well have been in view. I must return with my camera on a brighter day! This panorama stitching together three views I took of the Olympic site was created using a very handy free online programme called Microsoft ICE (Image Composite Editor). These interesting dates come up from time to time. The next is 20.12.2012, and of course, next year there is another big opportunity as we have 12.12.12. Now there’s a potential idea for someone … the alternative 12 days of Christmas … my dozen favourite things … If you are planning anything for that date please do link back here via the comments and I may well join in! Meanwhile pay a visit to Photo111111 to see how the project is growing.